NFC has been at the center of a number of advancements in recent months, but the technology is again breaking new ground in an unlikely industry—book publishing. 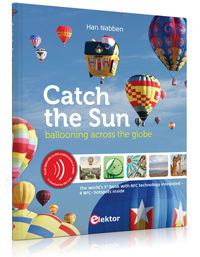 Han Nabben’s new book, “Catch the Sun,” makes use of the latest in semiconductor technology and provides a fascinating look into the history, science, practice and beauty of ballooning. Nabben’s book will carry a unique feature: NFC chips. The chips are invisible to the reader, but with the introduction of a smartphone the reader can activate movie clips. The clips can be used in conjunction with the reader’s social media profiles and will also allow access to free download of the book’s title song and background information on NFC. To add to the reader experience, two of the NFC tags have purposefully been left blank. Readers can use these blank tags — along with an NFC-writer app — to program these tags themselves, and add Web links and content to the book or turn a tag into a personalised digital business card. The idea behind NFC’s inclusion in the book is to enhance the reader’s experience by allowing them to access additional information and personalize their involvement by adding content.